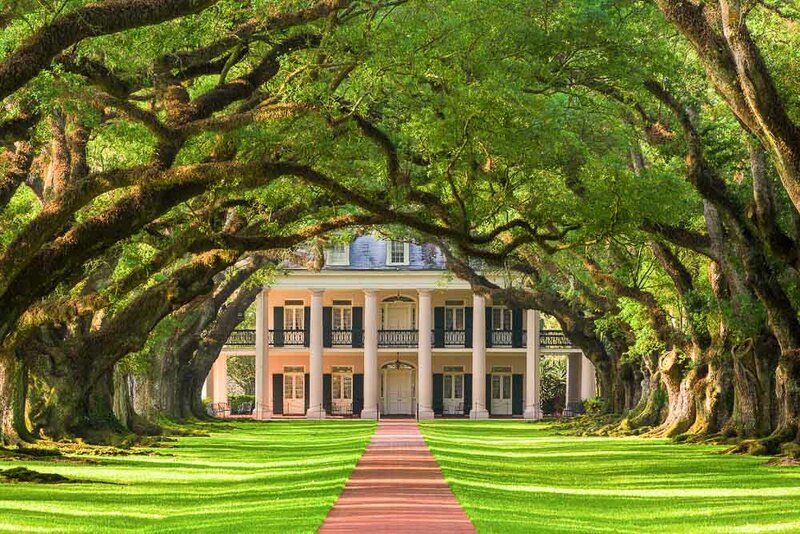 The tree canopy of Oak Alley Plantation. The oak trees were planted in the early 1800's and the property is designated as a National Historic Landmark. Oak Valley might have the grandest entrance of all the plantations: a quarter-mile of 300-year-old oak trees lead to the gargantuan Greek-revival mansion. It’s been the backdrop to plenty of trashy television in its time, too, from Nightrider to Days of our Lives. Oak’s guided tour here goes all out; actors in flowing gowns and exaggerated y’all accents go into detailed descriptions of daily lives of the masters and their slaves who “had to hand roll masters Jacque and Selina’s Spanish-moss mattress with rolling pins every single day” while sleeping in the equivalent of cages themselves. Try a complimentary Mint Julep; unless you’re the designated driver, of course. Laura was a French-speaking creole sugar plantation, distinguishable from the gleaming white exterior of English-owned plantations such as Oak Alley by its vibrant Caribbean colours. The rich creole folklore runs deep and the plantation claims strong associations to that wascally wabbit Compair Lapin (A.K.A. Br’er Rabbit). A visit to Laura also outlines the differences in the treatment of French and English owned slaves at the time. Slaves here were taught ‘European skills’, coveted for them, and could buy their way to a certain amount of freedom. Despite this, the plantation owner’s story still comes across louder than those who toiled here. There aren’t many still-standing plantations that showcase decadence and kitsch equally that way Houmas House does. The glitz includes extensive and beautifully preserved murals, a Marie Antoinette clock and eight Italian marble staircases while on the kitschy side you’ll find a ‘vampire kit’ (which was owned by Anne Rice) and pre-Civil war dolls that feature actual human teeth. The coolest bit, however, relates to a good old Hollywood fight that happened here during the on-location filming of Hush…Hush, Sweet Charlotte. Originally the horror film was to have starred Joan Crawford as Miriam Deering, but just as filming was starting, Bette Davis and Joan Crawford apparently got into a fierce fistfight just outside the house. Crawford received a black eye and quit the film. They famously hated each other. 4. Myrtles – who’s that ghost? Sure, Myrtles (circa 1796) ticks all plantation boxes: a 125-foot verandah, hand-painted stained glass and gold-leafed furnishings, but it has something (or someone) that the others don’t. The legend of Chloe began back in 1992 when a rather innocuous photograph of the plantation’s exterior showed what appeared to be the ghost of a slave girl. The story, of course, has its naysayers, but you can buy a Chloe postcard to keep the legend going. Apparently, there have been sightings of other ghosts too, which you can contemplate over some cajun and creole delicacies in the plantation’s Carriage House Restaurant, possibly also haunted. You can never ever truly appreciate the toil that the slaves of pre-war Louisiana endured but at Frogmore you can get a general, hands-on idea. You can arrange to take part in a harvest on the 1800-acre property, picking by the crop by hand while the bulk of the work is done by the computerized, 900 bales-per-day operation around you. There’s some legendary master-slave gossip at Frogmore that will keep your ears pricked up, but perhaps the highlight here is the Origin of Gospel tour with live vocalists singing secret slave songs.